In three years of running, I’ve raced a near gamut of distances. My first race was a 4-miler, and from there I kept building. I’ve raced a 1-miler, 4-milers, 8000 meters, 5-milers, 10Ks, 15Ks, 10-milers, half marathons, 18-milers, and marathons. But it wasn’t until yesterday that I finally ran my first official 5K! 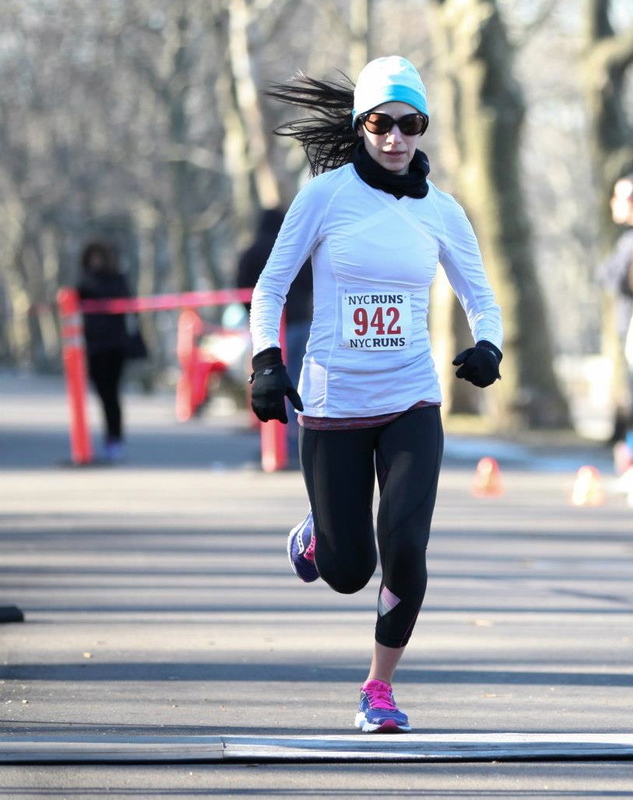 Leave it to me to choose a race in January, on a morning that “feels like 10 degrees.” Hosted by NYC Runs, the race followed an interesting course of twists and turns, flats and inclines, through Riverside Park. Never quite realized just how hilly it is off the river path. I love the small, independent feel of NYC Runs races. Their racing field is smaller, so the start is more relaxed. You roll up, place yourself in the start pen, and wait to run. This time, they held a moment of silence to honor the late Mayor, Ed Koch. I respect that gesture; thought it was a lovely thing to do. The plan was to race this with my friend, Jason. When we met up that morning, he warned me his hamstring felt off. Immediately after crossing the start mat, and hitting the first incline, we decided to ease off the pace. No need worsening an injury over a race. We stuck together on the course and clocked in with an 8:03 min/mile average pace. Even after backing off, we rolled in a respectable 25th and 26th places overall. For me, I landed 8th place female and 1st place age group. 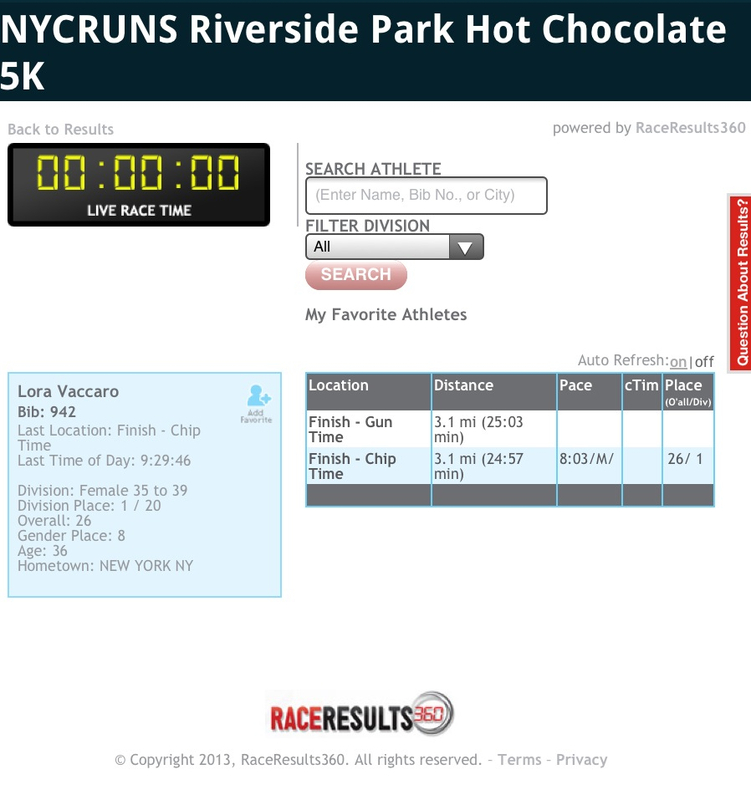 Seems a bit ironic to finally place in my age group with a non-race pace! I can’t help but joke that it simply means the speedsters were home that morning. But, the stats don’t lie. No matter, the experience was great fun. Numb feet, frozen hands, and burning lungs (from the cold): I loved every second of it! 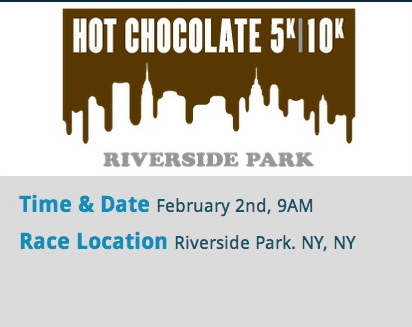 Now I’m determined to register for another 5K race in the near future. I want to race one with everything I’ve got! I’ve a new respect for this shorter distance. It’s a refreshing change of pace. congrats! but really, how was the hot chocolate?? This is fantastic! And first place in your AG is awesome for your first 5K. They are such fun races, and the atmosphere can’t be beat! Oh I’d love to see how you do in a “race pace” 5k! 5k’s are fun once you get over the “run till you puke” feeling! Congrats on your A/G award!